Highlights video of my flight appear below. I not only got to perform the take off, but handled (most of) my second landing ever, and my first using side-stick flight controls. Today was originally going to be a Friday off, and a long weekend. But given it started as a very foggy summer morning, it seemed likely that my Groupon gift flight appointment was gonna be postponed. So this day off quickly became a normal work day. And then, something happened. The fog lifted. It quickly became a glorious summer's day. Mid 80s, with reasonable humidity and excellent visibility. This meant we were on. Up and away, for the ultimate lunch break. A quick 10 minute drive the local airport. A little small talk with the cheery receptionist Deb Denardis, and the very-professional Chief Pilot Anthony Cresswell at Fly GForce. We boarded. Got cameras rolling. Tony pushed the throttle lever fully-forward. Heart rates sped up as the plane accelerated down the runway. Quickly airborne. So simple. So fun. Climbing is effortless, with 310 horsepower. If you just want to jump to the landing video, click here. This flight wasn't merely great. It was awesome. If you think commercial aviation is anything like the small plane experience, you are wrong. The experience is remarkably different, and a whole lot more visceral. Yeah, another word for bumpier. But also considerably more fun, with a much closer view of the the earth below. This particular four-seater is one nice plane. Sleek, modern, graceful. 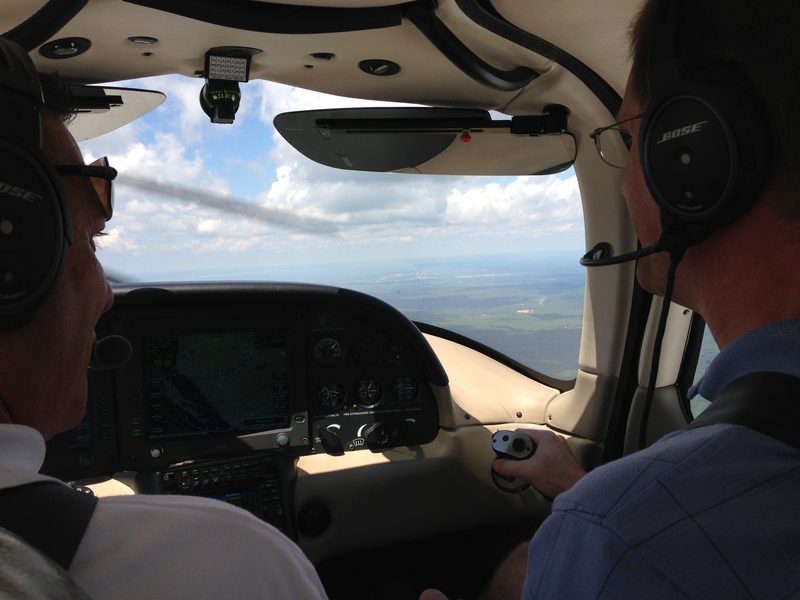 And so much faster than any Cessna high-wing I've ever been in. We averaged about 150 mph in this baby, zooming below the scattered Cumulus clouds, well below a few namesake Cirrus clouds. Terrain Ahead. Terrain Ahead. Terrain Ahead. Pull Up! Pull Up! Pull Up! which you can hear on this spot in the video. But Cirr_i_us-ly, those hills were quite far ahead. It was visual (VFR) fair weather flying. Thirty-five year pilot Tony had ample time to gently pull up, easily gaining a bit of altitude as the voice kept nagging with attitude. Safe, fun, and by the book. Reassuring. As my family below waved up at us gleefully, Tony waved the wing of our craft back at them, handily dipping the wing a couple of times. Smooth move. As we continued back, he allowed me some guided flight time as well, where I began with some moderate left/right and up/down moves, to get comfortable. This when I really felt how powerful and fast this plane is. A LOT of G force was felt by all. We were all impressed. The G forces were stronger than any car ride, and much longer duration than any roller coaster ride. A small, but deliberate and steady push on the side-yoke moved the nose earthward. We picked up a bit of speed, 160 mph. This was followed by my sustained pull on the side-yoke. Very strong Gs. Wow again. We were all impressed. It was also now readily apparent to me just how much more wrist force was needed at these higher speeds, with all that air racing across those control surfaces. I then aimed us back to my own neighborhood, using familiar roadways. A feeling of being in some sort video game came over me in a rush, as I used the joystick-looking side-yoke to begin to dive a bit, then dip the right wing, allowing a very clear view of my home as we flew by, even from both rear seats. Such fun. Time to head back to land, and get lined up with the runway. Yes, I even got to help land. While Tony handled subtle rudder corrections and throttle, I managed the side-yoke, with only a correction or two by Tony, mostly during the early phase of the final approach. He talked me through it all. Flare. Bleed off speed inches from the ground. The gentle bump as the tires make contact, quite near the centerline. Not bad, considering it's been about 25 years since the last time I've had a chance to try my hand at flying. Admittedly at a higher cost per hour then a typical Cessna high-wing. 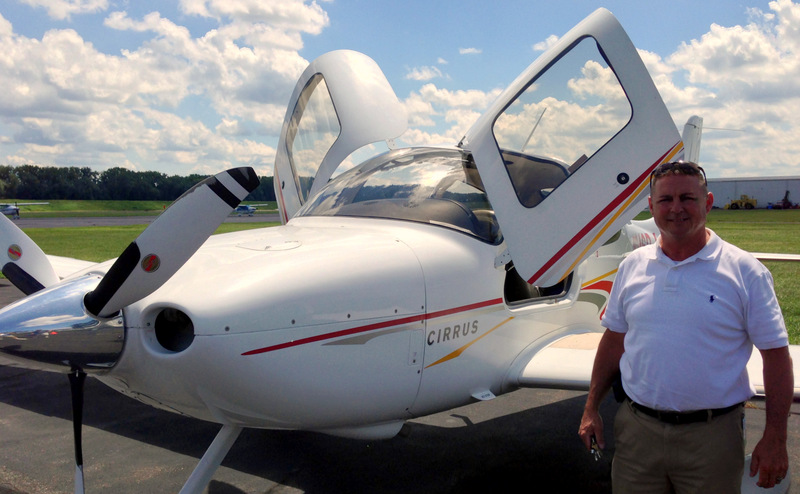 Meaning he Cirrus is a more economic choice for a professional pilot to squeeze in more charter flights per day. 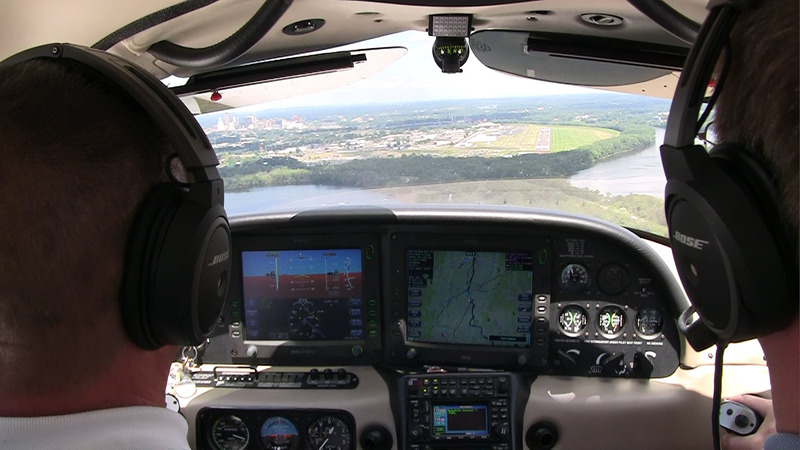 Cirrus SR22 planes are equipped with a rocket-powered parachute, just in case. Seems to me that could be particularly handy after a complete engine failure. Like, over a heavily forested area. Or in a spin. 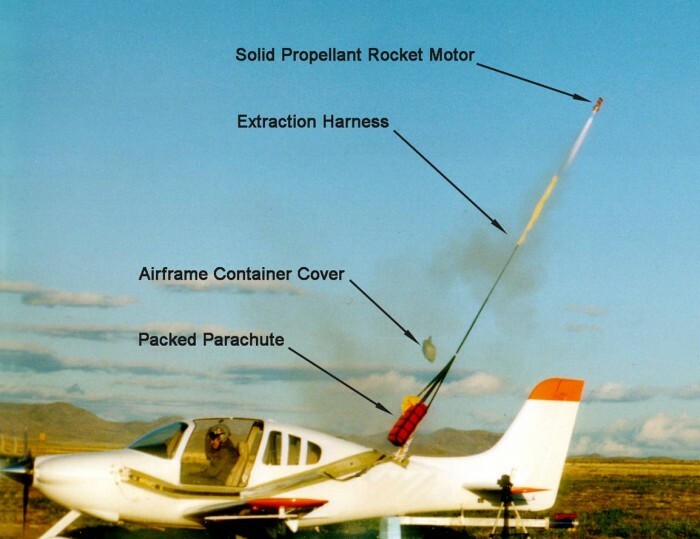 Emergency chute deployment is nicely demonstrated in this episode of "How Do They Do It" here, with the technology fully explained at the Cirrus site here. Read more about Popov's CAPS (Cirrus Airframe Parachute System) here. My 2 sons came along for the ride in the back seat, at no additional charge, helping with the photography. Sharing the fun with them made this day all the more special. Incredible Bose A20 Aviation Headsets were there for all 4 of us, allowing us to all talk with one another with ease. 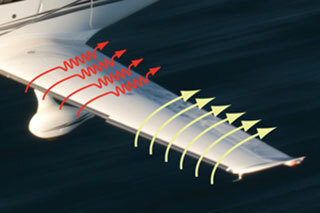 Given the considerable cockpit noise evident in any small aircraft, effective active noise cancellation is a must. It works, and works well. I got to sit in the right-hand co-pilot front seat. While it did feel a little odd having to look across to use instruments that were geared toward the pilot's left seat, that wasn't a big deal. 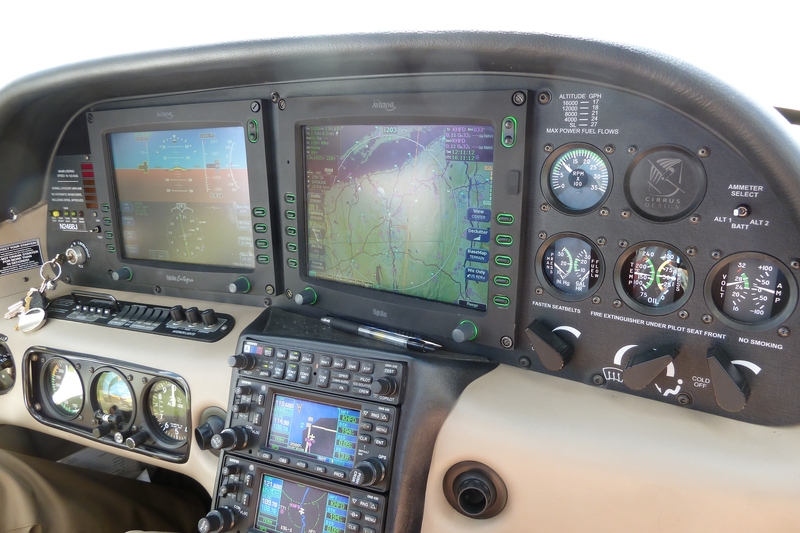 You'll also note the wrap-around instrument panel, geared toward keeping everything within the pilot's reach. More recent models even have electronic stability and protection, kind of like cars. In a similar vein, Cirrus required an autopilot controller that introduces a "LVL" or Level button to help address spatial disorientation. Everyone gets confused occasionally in the air (those that have and those that will?) and the history of aviation is rife with accidents caused by disorientation. Urban lore suggests a common expression in modern automated airliners is, "What's it doing now?" Press the LVL button - doesn't matter if the autopilot is already on or not - and the plane will roll level and hold altitude. If the world doesn't get better quickly Cirrus still offers CAPS, the parachute. An unusual wing design, with different angles of attacks on the inboard and outboard sections, to help keep control, despite a stall or spin event. I'm no expert, I'm not even a pilot. But that wing tweak seems to make a lot of sense. Tough, composite construction, airbag seatbelts, and the roll cage, seen here. with some safety stats here. Smartphone use was allowed! And they not only worked, they worked well, with the iPhone 5 showing 4G LTE on Verizon for most of the flight, likely because we stayed under 3,000 feet. That meant passengers could use WhatsApp to text the family at the right moments, easily sharing live video snippets and pics from the air, in mere seconds. How cool is that. In hindsight, we could have used an app like Glympse, to allow family on the ground to see our speed and location, in real-time, or a Google Earth kmz file, example here, for later review. Now imagine how cool Google Hangouts On Air or a YouTube Live event (which I'm now eligible for) would be? It'll likely be a while before such an opportunity arises again. But one thing's for sure. Smiling for the camera soon after we stuck a good landing sure was easy! I'm still working on putting the best footage together from the phones, the window-mounted GoPro Hero 2, and the tripod-mounted wide-angle-lense 1080P camcorder. The ride was a bit bumpy, and the lighting difficult, requiring a bit of HDR. Carefully mounting cameras in somebody else's plane, and getting good results despite considerable vibration, proved to be quite a challenge. But the results were worthwhile. Wonder what an Cirrus SR22 actually costs, new? Well, a 2013 SR22GTS base price is $479,900, or as low as around $200,000 for a used one, going back as far as a decade. How about just a propeller, it's only $8000 on eBay! Looking ahead, I do admit a future of all-electric flight sounds interesting, read more here and here. Lower emissions per passenger mile/greater efficiency. Even wilder tech would be entirely solar-powered flight, like the recent Solar Impulse flight from San Francisco to New York documented here. Thank you, Groupon $125 offer (which I upgraded to the SR22*), and Tony over at Fly GForce Aircraft Charters in Brainard Airport in Hartford, Connecticut. That was by far my best lunch break. Ever. Period. *If you're looking for a more docile site-seeing or picture-taking flight, you may prefer something slower, which the $125 coupon will get you. Call Fly GForce at (860) 278-7961 to discuss the type of aircraft available for your chosen day and time. All rides require you to sign a waiver. 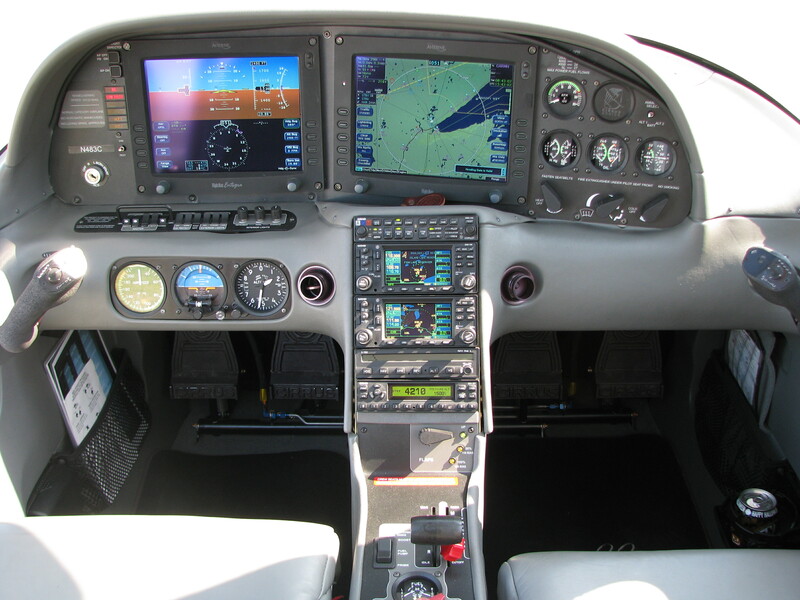 If you're looking for more speed, and the peace of mind of a parachute, this SR22 will do nicely. Not sure how long the SR22 will be available with a Groupon discount though. Announcement of our adventure on Google+ here. Google Hangout from 36,000 feet! by Paul Braren, June 7, 2012.
en.wikipedia.org/wiki/Cirrus_SR22 for complete history of enhancements, with the latest SR22T able to fly at 25,000 ft, requiring oxygen masks for passengers. 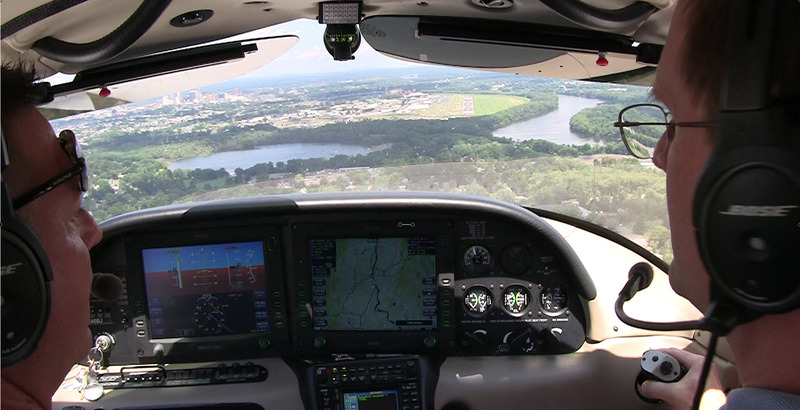 "Took a sleek Cirrus SR22 plane out for a spin over Connecticut, awesome!" published on YouTube on August 5th, 2013. We’re starting to get lined up with runway 2 at Brainard Airport, with the Hartford skyline beyond. I’m a little to the right here, but plenty of time to adjust. Watch the video below for the flight highlights and landing. Closer look at dashboard, top-right, where you can see GPH [Gallons Per Hour] at various altitudes. Tony standing the SR22, which looks cool even the unique doors wide open, which helps keep things cool during taxiing. Today, TinkerTry.com, LLC has been accepted into the Groupon Affiliate Program (anyone can apply). If you enjoyed this story, consider using this Groupon link when signing up for your flight, as a small token of your appreciation. Thank you! While the original Groupon for this flight has passed, note that the latest Groupon does not mention the Cirrus SR22, so I'd suggest calling ahead to 860-278-7961, to get clarification on the choice of plane. Incredible footage shows Leu Morton as he parachutes to safety. Good Morning America segment featuring ABC News footage.